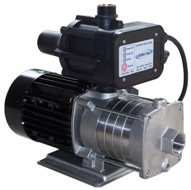 The Southern Cross AQ series of corrosion resistant pressure unit pumps have capacities from 1 to 5 taps and are suitable for rainwater or bore water tank supplies for general domestic supply. Units feature quiet operation and flow control. The AQ range follows on from the TQ range with the same hydraulic performance but now features an inbuilt Pressure Control type bladder control in lieu of an air pressure tank to reduce maintenance. The Southern Cross CBI Stainless Steel range of automatic water pressure pumps have capacities from 2-11 taps and larger models have a higher pressure range than the AQ series more suited to larger homes & industrial applications. These quality pumps feature separate “PRESSCONTROL” for flow regulation without a pressure tank as introduced some 17 years ago, and well proven in our tropical climate. Don’t forget, most domestic and commercial pressure units are not tropical weatherproof and require protection. We stock non rusting pressure unit covers to meet these needs for most smaller pump sets. For a quote to cover your requirement please contact us. LARGER AND SPECIALISED PRESSURE UNITS – Please contact us for a design & quote to suit your needs.